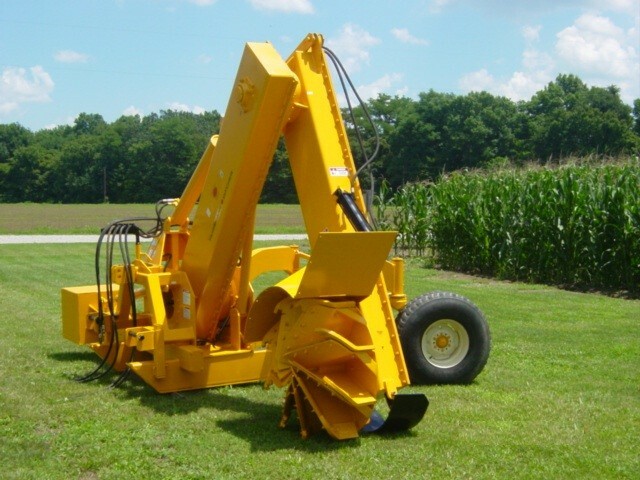 The Original Side-Arm, the largest of our three side-arm models, was designed to clean and maintain roadside ditches and other ditches that cannot be safely straddled with other ditching equipment. 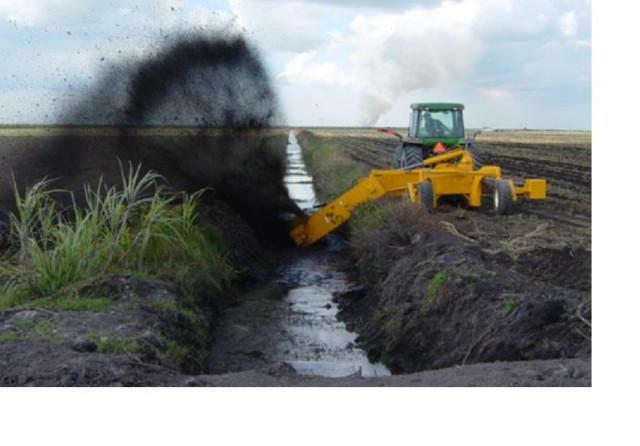 It\'s unique working operation allows ditches containing sod, water, roots and other debris including hard, dry dirt to be cleaned without damage to the machine. 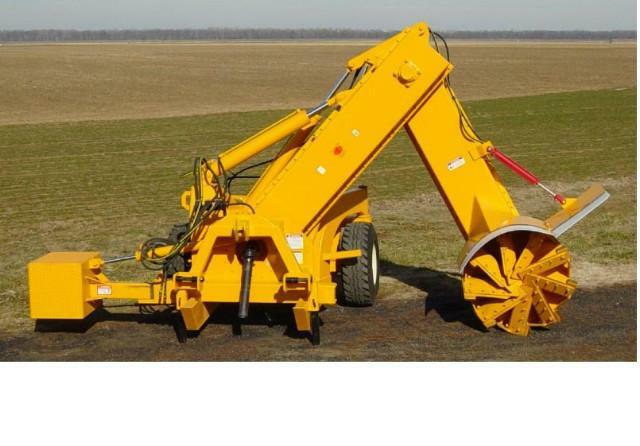 The 42\" 9-paddle impeller (digging wheel) is ruggedly designed to take the punishment it will receive in roadside ditches. It does, however, have two shear bolts if a large immovable object is struck. The impeller contains 9 heat treated cutting edges along with 9 hard-surfaced paddles designed to be resurfaced as they wear. Soil is thrown out the left side of the ditcher and may be distributed over a 65 foot area; rocks and other debris may go farther. The standard counter balance works in conjunction with the extension arm to keep the ditcher balanced in all working positions. The machine can be operated at a distance of 5 feet to 14 feet from the center of the tractor and at a depth of 9 feet to 3 feet, respectively. The arms (gearboxes) contain large shafts, heavy-duty sprockets and bearings, double 80 roller chain (main arm), and triple 80 roller chain (extension arm). Each arm contains oil for chain lubrication and an external idler adjustment to maintain proper chain tension. 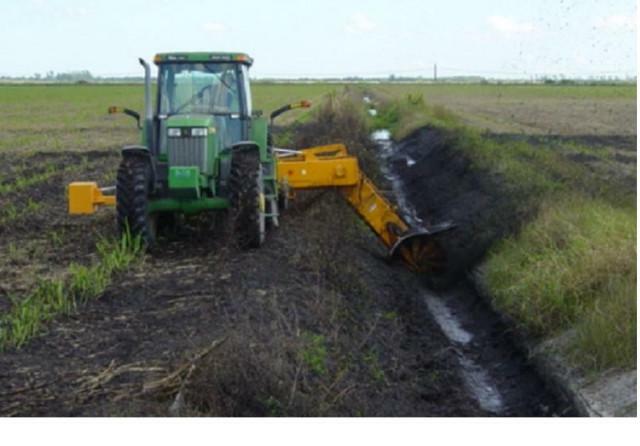 Operating the Original Side-Arm ditcher with a 200 HP tractor, 1 mile of ditch can be cleaned every hour, removing 10 to 12 inches of soil from the bottom. 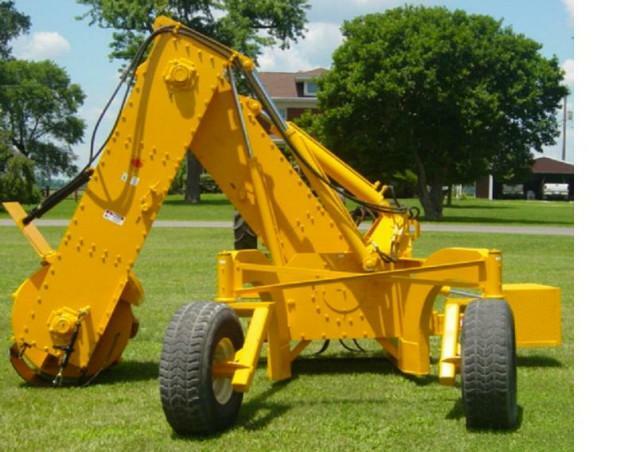 Options for the Original Side-Arm: hydraulic deflector (allows hydraulic control of the deflector from inside the tractor cab); deflector extension (allows soil to be bermed or piled close to the ditch rather than thrown).